A pneumatic nail gun that gets it's name from the fact that the nails come in a coil. They are typically used for siding and framing work. 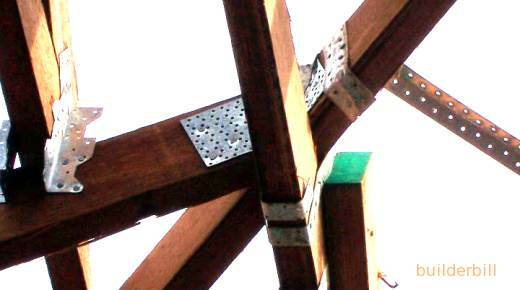 There are literally hundreds of connections in a normal timber framed or gang nailed truss roof. Each one may be fixed with say 10 nails. It is no wonder that roof framers don't hand nail any more. The weapon of choice for pro roofers and amateurs alike is the mighty coil gun. Various nail plates and straps al fixed with a coil nailer. Quite often one guy goes around with a box of nail plates and tacks them in position with just one hand nailed nail. Then another guy follows him up with the nailer. Unencumbered with clips and straps etc. and using the "Burp" method he can fix the clips very quickly. He does not attempt to shoot through the pre made nail holes in the clips, but shoots through the metal. 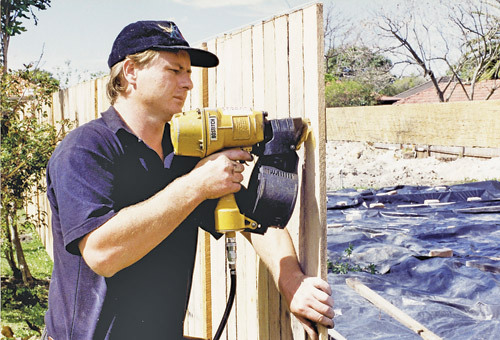 A coil nail gun used in fencing work. Image provided by Kennards Hire. Coil nail guns are sometimes called "Burp Guns" or "Bump Guns" here in Australia, because of the fact that when nailing metal strap bracing or nail plates to roofs then the trigger is pulled and then while the trigger is still down the operator can touch and lift the gun down and up any number of times and a nail is driven on every down stroke. This makes for very rapid nailing. If accuracy is needed then the normal method of placing the head of the gun in position and depressing it slightly to set the cocking mechanism before pulling the trigger once. As far as I know the burp effect only works with coil nails and I am not to sure if it is recommended by the manufacturers, but it sure saves an awful lot of time, with very little jamming once the technique is learnt. These guns take a range of nails from 1 1/4" to 2 1/2" with typical nails having flat heads and twisted shanks for better grip. Please remember to make sure that you use the correct nails for the job. In cases like the roof above, the nail coating, head and diameter are all laid down in (for example where I live we have a Deemed to Comply Manual) in the various building codes. In the early days of nail plate fasteners I had to remove many ceiling joists that had been fixed with "Triple Grip Plates" and it was an extremely hard job to do and still salvage the timber. They do not come off easily, so get the nails right first time.